Island Falls will feature winter festivities for the first time in many years thanks to the town’s Economic Development Committee. ISLAND FALLS, Maine — Island Falls will feature winter festivities for the first time in many years thanks to the town’s Economic Development Committee. 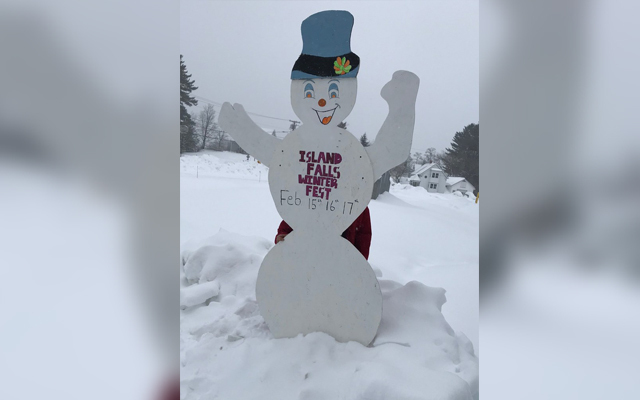 According to Town Manager Jutta Beyer, the town will celebrate Island Falls Winter Fest Feb. 15-17 with a variety of events slated throughout the town. Six-foot-tall wooden snowmen will soon be popping up in various locations as part of a fundraiser to benefit the town’s Economic Development Committee. For an “adoption” fee of $10, businesses or families can acquire one of 25 snowmen to be decorated. All decorated snowmen must be returned to the town office by Feb. 13 so they can be arranged for the big reveal party, Beyer said. The first-place winner will receive a prize of $50, with $25 for second and $15 for third. A “People’s Choice” awardee will also receive $50. Voting will take place from 7 a.m. to 3 p.m. on Feb. 16. The Island Falls Fishing Derby will again be one of the focal points of the winter event and takes place Feb. 16-17 on Mattawamkeag Lake and Pleasant Pond. Prizes will be awarded in multiple categories for both youth and adults. Registration and weigh-ins will be held at Jerry’s Food Store. For more information call 463-2828. On Friday, Feb. 15, a public supper will be held at the Municipal Building featuring chicken stew, bread, drinks and desserts, starting at 5 p.m. At 7 p.m. a “Fire and Ice” snowmobile parade will begin at Robinson Mountain on Dyer Brook Road. Saturday, Feb. 16, will see a busy day of events, including a public breakfast starting at 7 a.m. at the Municipal Building; a bake sale at Jerry’s Food Store at 9 a.m.; open market demonstrations from 9 a.m. to 4 p.m. at the Municipal Building; a quilt show at Whittier Congregational Church on Burleigh Street from 10 a.m. to 2 p.m.; and an open house at the Tingley House Museum from 10 a.m. to 2 p.m. The day will conclude with a supper at the Island Falls VFW Hall at 5:30 p.m.
Sunday, Feb. 17, will feature a public breakfast at the Municipal Building starting at 7 a.m., while a public lunch will be offered from 11 a.m. to 1 p.m. at the public landing at Mattawamkeag Lake. For more information on the events offered, contact the town office at 463-2246 or email tmislandfalls@fairpoint.net.